1. 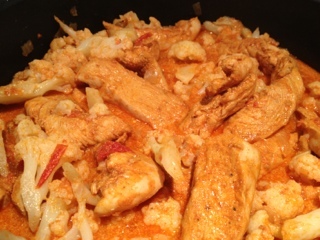 In a bowl, marinate the chicken with paprika and salt and pepper. 2. Heat the olive oil in a pan and brown the chicken for about 5 minutes. Remove chicken to a plate. 3. Add the onion and brown for about 5 minutes. Add the tomatoes and 3/4 cup of water, and simmer for about 15 minutes. 4. Return the chicken to the pan and simmer for another 10-15 minutes. Stir in sour cream and heat through. 5. Stir in the freshly steamed cauliflower (if cauliflowers are cold, heat through), and serve with white rice.